I don’t know if it is the files I have on my computer, but each of my machines’ index file size occasionally just goes out of control. This covered KB 2838018 The Windows.edb file grows very large in Windows 8 or Windows Server 2012. Unfortunately however even after the hotfix is installed, as seen below, 66 GB for the index on a 439 GB drive seems very much like the symptom described. The instructions in the KB cover how to rebuild the index. I find just stopping the indexing services, deleting the file and restarting the services a quicker space recovering resolution. Note that your search everywhere in Windows, even applications from the start menu, won’t work for a little while. 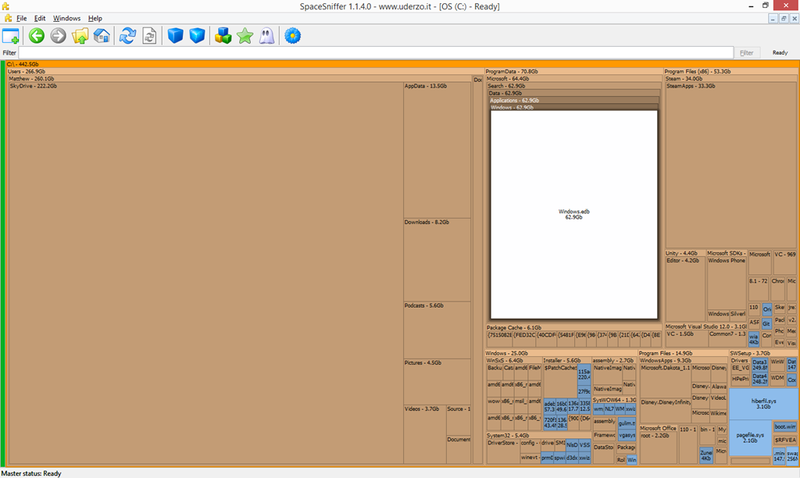 Finding space to free and finding this rogue file is very easy with Space Sniffer, it is the best disk space visualization since Space Monger 1.4. Be sure however to run it as Administrator, otherwise those system files will not be shown. The file is located at C:\ProgramData\Microsoft\Search\Data\Applications\Windows. After a rebuild it is a more reasonable 1.8 GB. Some time later on a work mates computer I saw him running 10.5. He usually runs the pre-release but told me this was the release, but it was not automatically updating. 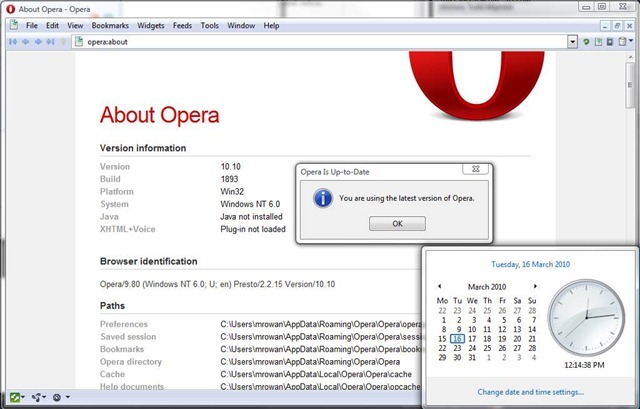 I check it out on Opera.com and sure enough it was released on the 2nd March. The day was the 16th so I tried checking for updates, but was told I was up to date. I therefore went and manually updated at work, but was not so happy with the release yet for home. Sometime early April it began prompting to update at home and I did. I can see why the staged release was done. To me it still has some stability issues not seen in the previous version. On Windows 7 however, I now enjoy Opera with Aero Glass, as well as Aero Peek and Jump Lists. Now, you can easily access your Speed Dials, tabs and more from the Taskbar. And it is faster than ever. So well worth the update. 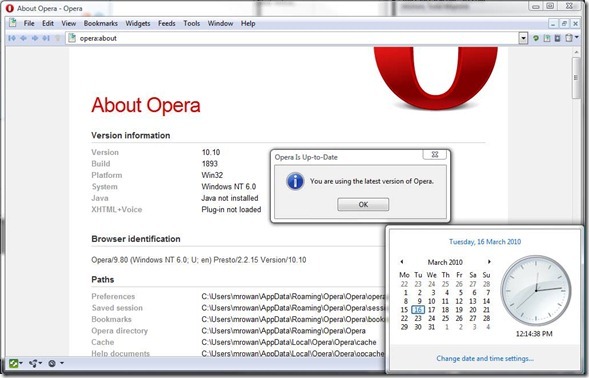 Well done to the Opera team. devices, such as the Microsoft® Xbox 360™. On the Media Center under Networking in Explorer the Media Sharing from desktop is shown as a network device. Clicking on this opens up media player and the shared media library is available as a separate library and works just like the local library. – No, Media Center in Vista does not look for shared libraries even though they appear in WMP. – Yes, this is something we are seriously considering for our next release. Stay tuned. – The best workaround today is to share your music out on a network share and have WMP grovel it. However, like others have said, the groveling process can be slow over a network and the best method is to manually add the shared music to your library. Ok, so no Media Sharing consuming for Media Center. At least they are aware of the issue. Looking closer at the Windows Home Server Media Sharing documentation there is a section on Streaming Music to devices and Media Center is included. The recommendation is to enable the Home Server guest account and add the shared folders to the folder watch list. I already have the Media Center user a user in the Home Server, so I do not need to activate the Guest account. I am cautious that if the user has write access to anything, which is useful to update media information, the current home server corruption bug may appear. Disappointed with Media Center, I then went for a last ditch effort to make use of this Media Sharing. My wife uses exclusively my old laptop. It is running Windows XP Professional with Media Player 11. Immediately the Media Sharing menus did not work the way they did in Vista so I was suspicious. Very quickly I found the Media Sharing FAQ which nicely told me XP could share the media library, but not consume one! What good is that? I can see the usefulness of Media Sharing, but unfortunately at the moment it can only be used if you have an Xbox 360, which if you have a Media Center alternately could be used as a Media Center extender anyway. I’ve been running Vista on my development computer for several months now. On the whole I have been quite happy with it. Things have worked well, stability has been equal to XP, speed (once I got more RAM) has been better. One strange thing I had though was that pictures in the Windows Photo Gallery looked a little strange. After a little searching for how to change the background color, I found other people with this symptom describing it as an off color, yellow tint, orange or yellowish tinge, beige, cream colored background which, shows through the picture itself, distorts the colours, or bleeds through pictures. In most situations the problem went away in slide show mode. This was an annoying issue, making me avoid looking at pictures whatsoever in Windows Photo Gallery. This wasn’t that much of an issue because I do not use photos or pictures often on my development machine. But before I was going to install Vista on my other computer where I view photos constantly, I needed to ensure that I would not have this issue. The solution is found here. The problem ended up being the incorrect usage of a color profile set by a Windows Update for the monitor driver. This commonly occurs on Samsung monitors. My monitors are Samsung’s. The monitors on my other computer are LG’s and this issue did not occur. Fortunately, the fix is very simple. Just remove the color profiles for the monitors. Since I have dual screen setup I did one monitor at a time to see if it worked. The article said you must restart your computer. I did not find this the case. Simply restarting Windows Photo Gallery was enough. The difference was quite obvious when I put the picture split across the two screens. Adjusting the other monitor color profile fixed it completely. I just read Confessions of a Desktop Neat Freak over on Channel 10, which highlights the feature in Windows where you can hide the icons on the desktop. This is all well and good, but as Larry said himself in the post, it is just like sweeping it under the carpet. Although this helps it look clean, so that you can see your nice desktop background picture, what real benefit is it giving. It hasn’t really done anything to help you keep it neat. Potentially it has made it worse by allowing the mess to grow bigger with an out-of-sight, out-of-mind attitude. I propose to use your Windows desktop as you would your physical desktop. Typically, you don’t leave piles of paper right in front of you on your desk. You file papers away, either into a filing cabinet, piles on your desk, or bin. Accessible if required, but not interfering with your current task. Things you do leave on your desk are items you use all the time, like a pen and phone. These are equivalent to your desktop shortcuts to commonly used applications. In Windows though, pinning these to the start menu can be more effective, since they can be seen quickly without minimising your current work. While you are working on a task, often it requires a set of documents, reference material, drafts and other random things being bought together. In development, when building a new feature or debugging some code, I often have a few code files, test scripts, saved web pages or PDF’s for reference, and other miscellaneous files that are all useful for that task. These files I just dump straight to the desktop, since it is clear and a ready workspace. Once I have finished that particular task, I sort the files. Some get deleted, others get filed safely away. The desktop is a very convenient workspace if it is keep clean for that purpose. Files can be grouped into sections easily to help better tackle the task. BumpTop takes this further to really help make the computer desktop like a real desktop. I work so that if there are any files on my desktop, it means I am in the middle of a task. I do similar with my email, anything in the inbox needs action taken against it. If the email has been dealt with, it is filed or deleted. This all helps me stay neat, organised and effective at my tasks. I understand that some people’s physical desktops get more out of hand than their Windows desktop, and in the end, what’s wrong with a messy desk?